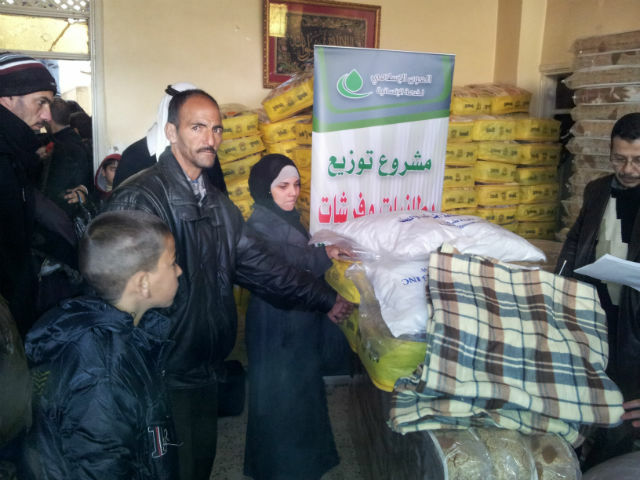 Muslim Aid have distributed Keep Warm Kits for Syrian refugees in the Alzarqa, Alrusseifa and Alhussein camp in Jordan. Around 150 families were given mattresses, blankets and pillows to help them keep warm and safe during the cold winter. As the Middle East faces one of its coldest winters in decades, hundreds of refugees crossing the border into Jordan every day, have left without any belongings. Last week, heavy snow and rain flooded some camps. Through Muslim Aid’s International Winter campaign, Keep Warm Kits are being distributed to help families suffering from the bitter cold. “One day during an air raid a bomb hit my neighbor’s home and killed their daughter. That led me to take my sons and seek refuge in Jordan. I was so afraid that one of my family may get hurt or killed. We left our homes without taking anything. We are in urgent need for clothes, the weather is so cold here. We need food and baby diapers and milk for my babies. I would like to thank you all for the good help you are delivering to us. May Allah –SWT- protect you and reward you all”.